LBD & ONESIES - A Lifestyle Blog: Join Pink Parlour's Hair Free Day! Join Pink Parlour's Hair Free Day! 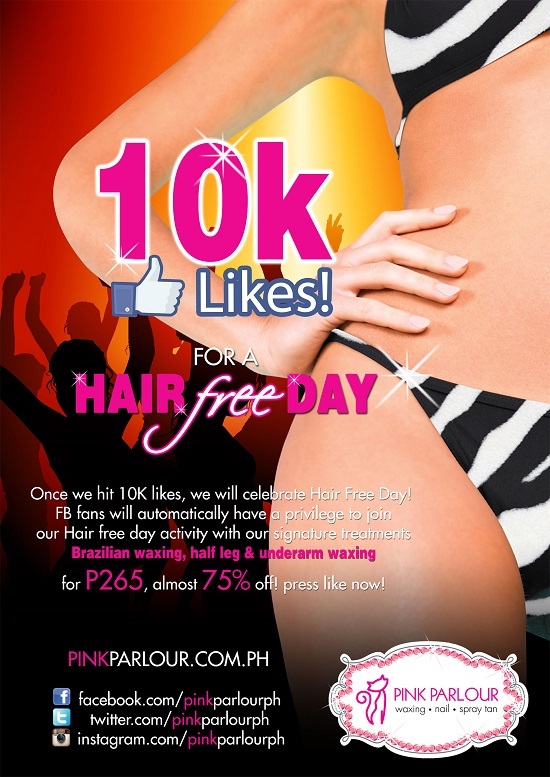 Pink Parlour Philippines, our favorite waxing, tanning and nail salon will be celebrating Hair Free Day once they have gained 10,000 likes on their Facebook page. All of their Facebook fans will have the chance to avail of their signature Brazilian waxing treatment (originally priced at P900) for only P265.00! Other services such as half leg waxing (originally priced at P600.00) and underarm waxing (originally priced at P350.00) will be available for 70% off! :) So like and share their page now and be sure to tell your friends to like their page as well! See you at Pink Parlour's Hair Free Day!